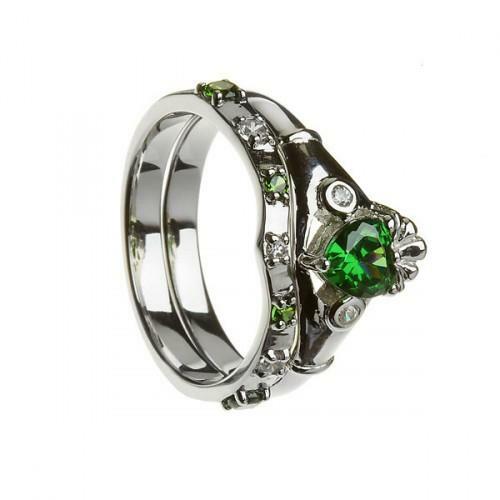 This beautiful ring is part of our claddagh ring collection and comes with a matching band.This beautiful sterling silver claddagh ring has a emerald heart surrounded by cubic zirconia with a matching band which has 3 cubic zirconia and 3 emeralds. The width is 9mm and height is 9mm. This beautiful sterling silver claddagh ring has a emerald heart surrounded by cubic zirconia with a matching band which has 3 cubic zirconia and 3 emeralds. The width is 9mm and height is 9mm. This ring is made to order in your size in Ireland please allow 4-6 weeks for delivery. Price is for sterling silver. Also availble in 10ct &14ct gold see prices above.